There are four types in the spearfish family all belonging to the billfish family. The short bill spearfish (Tetrapturus angustirostris) also known as the short nosed spearfish, Japanese spearfish, or slender spearfish. (Tetrapturus pfluegeri) is the long bill spearfish or Atlantic long bill spearfish. (Tetrapturus belone) is the Mediterranean spearfish and lastly the round scale spearfish (Tetrapturus georgii). Spearfish are pelagic, open ocean, deep water fish found in most temperate and tropical oceans, along the continental shelf and current lines. Spearfish can be distinguished from other billfish species by its lean, lightweight body. Equipped with the shortest bill of all the billfish, and has a dorsal fin that is less than 50 percent of its body height, higher than a marlins and lower than a sailfish. The long bill spearfish has a bill about twice as long as its lower jaw, while the short bill has one that is barely longer than its lower jaw. Common for all variations is that the dorsal fin is bright blue with no spots. The maximum weight is about 100 pounds and 20 to 60 pounds is more of the norm for this species. Even though spearfish exist in many oceans, they are not abundant anywhere, and rarely caught anywhere except Hawaii and the Mediterranean. Shortbill spearfish live in the Pacific and Indian oceans while the Mediterranean spearfish live only in the Mediterranean. 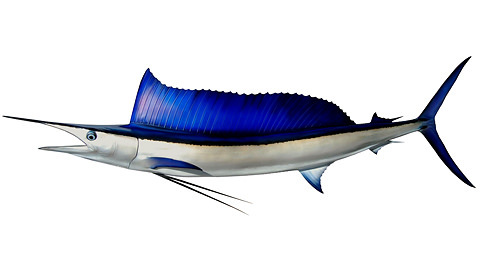 Roundscale spearfish live in the eastern Atlantic and the western Mediterranean, near Portugal and Spain, and closely resemble white marlin. Longbill spearfish inhabit the northwest, central and south Atlantic. All Spearfish are surface feeders, eating other small or medium fish and squid. They mature at two years old, and rarely live past three years old. The maximum age may be up to five years but is not very common. Spearfish are not caught as gamefish in most parts of the world as their numbers are too low and being reduced by accidental by-catch. Most spearfish are killed when they are accidentally caught by “sport” fisherman targeting other billfish or by commercial long liners fishing for tuna.